The 2019 Asilomar Retreat will be held. The on-site classroom, seen below, no longer exists. Celebrating our 26th year at the Asilomar Conference Center. The 2019 Asilomar Retreat has two spaces available. Located in the coastal city of Pacific Grove, California, Asilomar Conference Center is the heavenly setting for our expanded getaway. For six days and five nights we sew, collaborate, inspire and learn. For those who wish we can direct a shopping excursion in the area. The registration fee covers housing in the Lodge (two people in a room) and all meals. (Single rooms are available at extra cost.) Bring your sewing machine and a project or two. 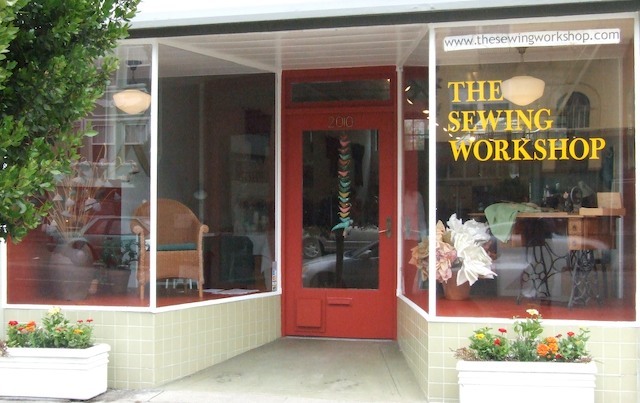 We provide the sewing space, auxiliary equipment (sergers, irons, cutting mats. etc.) and personal assistance. As of December, the retreat is sold out.